Russia possesses one of the richest and most admired literatures of Europe, reaching back to the eleventh century. A History of Russian Literature provides a comprehensive account of Russian writing from its earliest origins in the monastic works of Kiev up to the present day, still rife with the creative experiments of post-Soviet literary life. The volume proceeds chronologically in five parts, extending from Kievan Rus' in the 11th century to the present day.The coverage strikes a balance between extensive overview and in-depth thematic focus. Parts are organized thematically in chapters, which a number of keywords that are important literary concepts that can serve as connecting motifs and 'case studies', in-depth discussions of writers, institutions, and texts that take the reader up close and. Visual material also underscores the interrelation of the word and image at a number of points, particularly significant in the medieval period and twentieth century. The History addresses major continuities and discontinuities in the history of Russian literature across all periods, and in particular bring out trans-historical features that contribute to the notion of a national literature. The volume's time-range has the merit of identifying from the early modern period a vital set of national stereotypes and popular folklore about boundaries, space, Holy Russia, and the charismatic king that offers culturally relevant material to later writers. This volume delivers a fresh view on a series of key questions about Russia's literary history, by providing new mappings of literary history and a narrative that pursues key concepts (rather more than individual authorial careers). 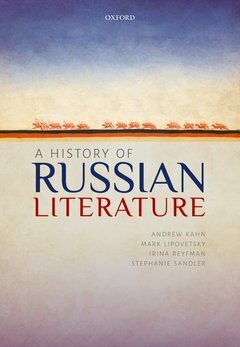 This holistic narrative underscores the ways in which context and text are densely woven in Russian literature, and demonstrates that the most exciting way to understand the canon and the development of tradition is through a discussion of the interrelation of major and minor figures, historical events and literary politics, literary theory and literary innovation.